Story Factory Chichester returns with a brand new workshop – and it’s going to be beastly! Providing sessions in creative writing, art and music in one imagination-stretching day, ‘Magical Portals and Mythical Beasts’ will be the umbrella theme for the next Story Factory workshop. Taking place at the end of half term on Friday 27 October, the focus will be on stories that allow a full and free creative rein. From Platform 9 ¾ to Alice’s rabbit hole and Narnia’s Wardrobe, stories of portals to magical lands – filled with mythical creatures – continue to delight and thrill. Focussing on descriptive writing and rhythm, specialist practitioners will support children in writing about and illustrating their accounts of a trip into a strange new realm. Story Factory’s resident musician Mike Fry will facilitate the musical element, including the ever-popular Big Song Writing Challenge. With plenty of fun and games along the way, there will also be storytelling sessions in the Cosy Corner for younger children. Founded in 2014 by professional writers Katy Lassetter (of Chichester Copywriter) and Vicky Edwards, Story Factory aims to celebrate and encourage children’s creative flair. Suitable for children aged (approximately) 6-13; guest experts help youngsters to explore stories through words, art and music. With workshops taking place in April 2017, October 2016, April 2016, October 2015, April 2015 and October 2014 – past guests include authors, publishers, illustrators, story massage practitioners, and newspaper editors, all of whom have loved being part of such inventiveness and originality. 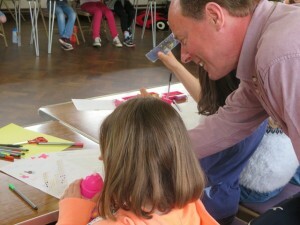 “From the moment the children arrive they are bursting with ideas for stories – it’s like being at the centre of a what-if whirlwind,” said Abi McMahon, a previous guest expert from Summersdale Publishers. Sussex Arts Academy (SAA), which aims to provide easier access to the best in arts and cultural education for young people across West Sussex, plays an important part in this creative event. SAA has helped Story Factory Chichester to secure funding from the National Association of Decorative & Fine Arts Societies (NADFAS), a leading arts charity that opens up the world of the arts for everyone to enjoy, learn, participate in, and preserve. Booking information: The workshop will take place on Friday 27 October at St Wilfrid’s Church Community Hall, Sherborne Road, Chichester (10.00-4.30), with a sharing of work presented for parents of participants at the end of the day. For further details see the Story Factory Facebook page and for booking contact Katy Lassetter. This entry was posted in Chichester Copywriter gets Creative, Chichester Copywriter News, Literature Events, Story Factory Chichester and tagged art, authors, Chichester Copywriter, creative writing, Katy Lassetter, music, newspaper editors, professional writers, publishers, Story Factory Chichester, Summersdale Publishers, Sussex Arts Academy, Vicky Edwards., West Susses. Bookmark the permalink.